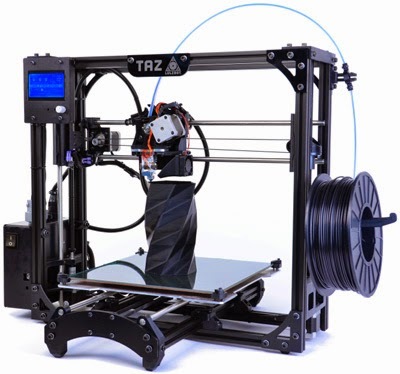 The evolution of desktop 3D printing continues with TAZ, LulzBot’s top-of-the-line, highest quality printer to date. Merging technical expertise with design sensibilities, TAZ is for inventors, entrepreneurs, design engineers and prototypers — bring your ideas to life with TAZ. The LulzBot TAZ 4 3D Printer is a versatile, high performance desktop 3D printing machine that respects your freedom to create. Plus, this machine was recently awarded Most Maker Machine by Make: magazine in their annual 3D printer shootout! All LulzBot products are Open Source Hardware (also known as Libre Hardware), meaning you can adopt the latest and greatest technology being developed across the 3D printing industry. A LulzBot 3D printer was the first hardware product, and remains the only 3D printer, to receive the Free Software Foundation's Respect Your Freedom certification and be fully compliant with the Open Source Hardware Association definition. From experimental filament materials and the modeling software of your choice, to new accessories like hot ends and print surfaces—experience the joy of user freedom! Looking for a desktop 3D printer that can print large items? bed that can print large items, or many small items. TAZ 4 is designed with new features and components so you're just a plug-and-play away from using a dual extruder mount to print two different colors—or two different materials—at once! Please note: Separate purchase of a Dual Extruder Tool Head is required. What can you print with? LulzBot users have many filaments options beyond common plastics like PLA, ABS, and HIPS. Exotic filament options include nylon- (Taulman Bridge, Taulman 618, Taulman 645), wood- (Laywood), stone- (Laybrick), and rubber-like (NinjaFlex) materials, to name a few. For optimal performance, we suggest printing with LulzBot filament available here. Our Open Source Hardware philosophy empowers you to download/print upgrades and replacement parts for your 3D printer, and make whatever modifications you want! Plus it's compatible with a wide range of Free Software options, meaning the power is in your hands with this versatile machine. TAZ 4 features tetherless printing through an SD card with a multi-functional graphic LCD controller. Your printer comes with complete documentation,including a detailed manual with information for unpacking the printer, setup, downloading and using software, and starting your first print.